Solution Focused Brief Therapy offers at least an enhancement to existing therapeutic approaches and at best an alternative to other evidence based therapies. It utilises process techniques that predate CBT but which the latter has begun to embrace, whilst sharing a great deal with both Systemic and Client Centred approaches. This course gives you an in-depth introduction to this effective approach. This evidence-based two-day course is designed to provide you with the highest possible standard of training, a solid grounding in Solution Focused Brief Therapy (SFBT) and enable you to make immediate use of your learning on return to your workplace. It is invaluable in a range of health care and social services environments across the age span. Do I need prior knowledge of Solution Focused Brief Therapy? No prior knowledge is required. However, a background in a "helping profession" working within a defined model of practice is desirable but not essential. How will I know if Brief Solution Therapy will work with my clients? They are very unmotivated/ damaged/cognitively impaired. I’m not a Brief Solution Focused Therapist. I’m a CBT Therapist/Client Centred Therapist/ Exploratory Psychotherapist/Group Therapist. Is this course any use to me? Yes! There are a number of reasons for this. Firstly, Brief Solution has often been described as a non-theoretical approach. Without going into further detail here, you are likely to find that many of its components “bolt onto” your existing therapeutic modality. It does not require you to “give up” your current approach in order to use it. Secondly, it has a strong evidence base regarding its outcome effectiveness. It is also supported by a great deal of work within general psychology (especially neuropsychology). Thirdly, although providing new and different tools, you will find much that is already familiar and similar to the approach you use. Actually I’m not a psychotherapist/counsellor at all! Is this course any use to me? Yes… as long as you are involved in the field of helping people to change their behaviour and attitudes! For instance, it has been used in a variety of health behaviour change fields (including smoking cessation and weight loss) and with client groups as diverse as the unemployed and those with learning difficulties. One of the major UK books in the field is written by a Speech and Language therapist and it is also used as a management, supervision and team building approach. Evidence base and applicability to different client and staff groups. Understanding the trap of the CLEPPER approach in traditional models of helping. Rapport building (with a difference!). What constitutes a complex case? Where does the MQ fit into therapy and where do you go afterwards ? What to do if your client’s preferred future is one you can not support ? You receive a Certificate of Attendance for 14 CPD training hours on the day. 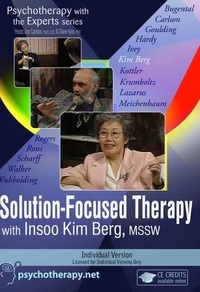 As the name implies, solution-focused therapy emphasizes clients? existing strengths and skills instead of problems and psychopathology. In this video, Berg demonstrates her uniquely optimistic and supportive therapy style. See how effectively she connects with the client, using her language, tracking how the client frames her problems, and mirroring her skills and assets. Hosts Jon Carlson and Diane Kjos introduce Berg and facilitate an enlightening discussion, which sheds light on the subtle nuances of this seemingly simplistic approach.